In his text The Weird and the Eerie, the cultural theorist Mark Fisher analyzed two of the most important elements in various works of art that veer into the territory of horror and science fiction. The weird, as found in David Lynch’s Inland Empire, various texts by HP Lovecraft, Rainer Werner Fassbinder’s World on a Wire and other works, is defined by the existence of something that should not exist (as in Lovecraft’s novels, impossible creatures materialize as factual realities). The eerie, as found in Jonathan Glazer’s Under the Skin, Daphne du Maurier’s story Don’t Look Now, and the (according to Fisher, and me, for what it’s worth) under-appreciated Christopher Nolan film Interstellar, materializes when something is noticeably absent: “Eeriness radiates from the ruins of lost ones,” writes Fisher. 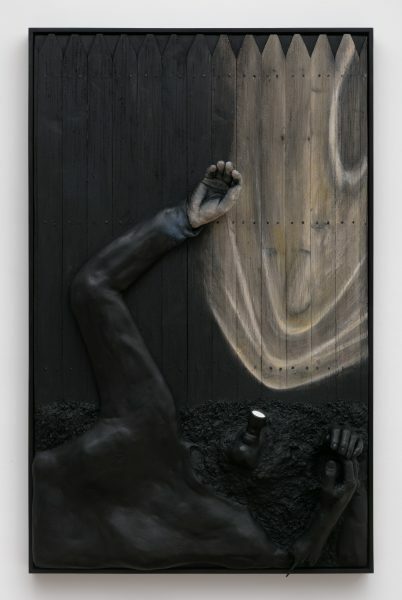 With this, I am comfortable arguing that the sculpture, drawing, photography and performance of artist Dan Herschlein sit firmly within the realm of the eerie. It is not wrong to say that horror tropes manifest in Herschlein’s art, but buckets of gore and acts of sadistic violence have about as much to do with Herschlein’s work as pretty pictures of flowers. Instead, Herschlein’s art is about anxiety, and anxiety is just the energy we use to fill in the gaps of what’s missing. His images, strong and provocative as they are, are missing something by design. 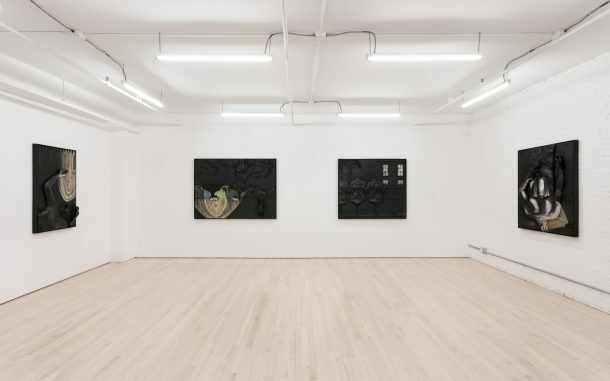 Herschlein’s current exhibition in the backroom of JTT Gallery, Night Pictures, consists of four panels made of wood, plaster, and wax. 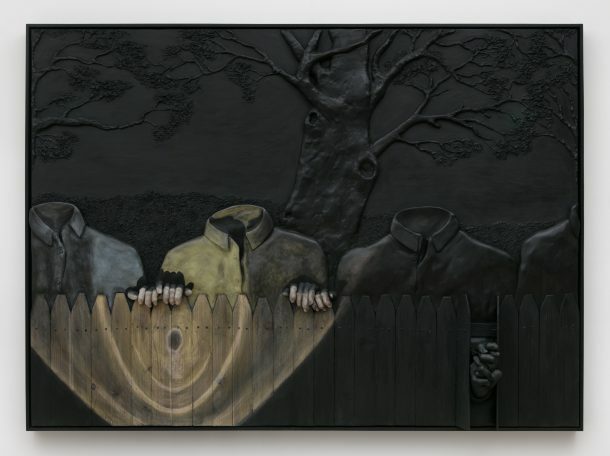 The pieces derive thematic influence from the work of 20th century artists like Grant Wood and Andrew Wyeth, and form a loose thematic structure of interconnected events happening around a standard American home. Like those aforementioned artists, the horror is placed within the banality of the events. Echoing the title of the show, Herschlein’s works are washed in darkness and illuminated by single light sources that reference Herschlein’s background in performance art. The light reveals bodies and actions that unsettle, but as always, the horror is derived from the vagaries and unknowability of emotions (or shall we say, the “eeriness” of emotions). “The idea with that is definitely to make things that would be unseen very much more present,” says Herschlein. Herschlein sculpts bodies without heads, hands without arms, and architectural objects becoming bodies. 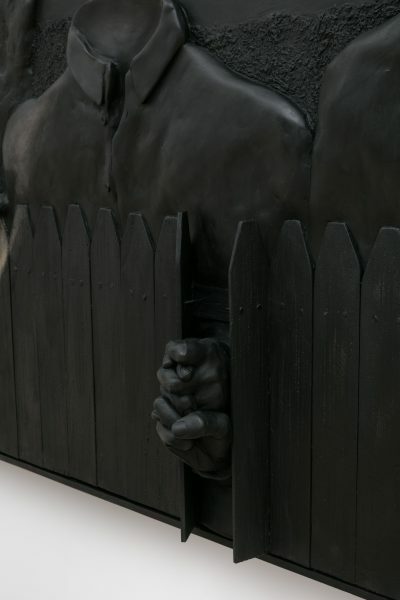 His work deals with implied narratives, or perhaps, hidden narratives. In the tradition of Fisher’s conception of the eerie, Herschlein’s work always feels like it’s alluding to something strange and otherworldly, but leaving it open-ended as to what is actually missing, forcing the viewer to fill in those gaps with their own repressed traumas, desires, and tragedies. Adam Lehrer: You imbue these domestic objects with dread and trauma. How did you end up with this near hyper-focus on the unsettling? Herschlein: Yeah. All those cultural pressures that make people feel like they have to live up to something and don’t let them see that they don’t have to be that person. They don’t even have to stay in the town. In Long Island, there were a lot of class issues. The town I specifically grew up in, Bayville, was very working class. My dad dug clams. There were a lot of bay men. The people who get into those jobs are often drug addicts or alcoholics–my dad included. The way it worked was he was just out of time. But surrounding all that was immense wealth. Like, Billy Joel lives a half a mile from me. Lehrer: Did you know you wanted to be an artist growing up? Herschlein: No, I didn’t. I didn’t even know you could. I always was interested in drawing, in comic books, in movies. I was into skateboarding. There were other outlets for being creative that I was completely invested in. I think when I was graduating high school and realized you could go to art school, I was amazed and excited. I never thought about the future in that way. Lehrer: Skateboarding is definitely huge for guys our age. That was my first exposure to certain types of music and the graphics on the boards. Plus, Jason Dill was my favorite skateboarder, and if you knew about him, you’d eventually learn about Dash Snow. There are overlaps between skateboarding culture and the art world. Herschlein: Yeah, he was my favorite too. The first art gallery I ever went to was Jason Dill was curating at Dactyl, a gallery in TriBeca. I ended up skating over there and wasn’t sure if it was a private event or something, and they were playing video games. I looked through the door, and Dill was like “Hey, come on in.” I ended up playing video games with Jason Dill and Neckface. I was like, “Is this what a gallery is like?” Which is obviously not accurate, but it really made me feel like this is available, as opposed to just feeling scared of galleries. And I still find them to be a little scary. Lehrer: Your work is layered with psychological tension–is it a slog to make or is it therapeutic? Herschlein: Slogging through it is therapeutic. Hand making a physical form for weeks and months gives me the time I need to think it through. The image is not totally something I understand at first, but that develops as I work with it and touch it. I’ve always been interested in mind exercises. Things that can get you to look from a different perspective or feel a different way, and access different things. Lehrer: I want to talk about horror for a second. We share that in common as an interest. I think because horror films are mass entertainment products, but at the same time, they are full of very provocative, very jarring, very indelible images that when you watch them at a young age, they really inform your sensibilities. I’ll never forget seeing the Xenomorph for the first time in Ridley Scott’s Alien. So what were those horror films that really made an impact on you at an early age that you think are still shaping your aesthetic sensibilities? Herschlein: The first movie that terrified me was the Universal Studios one with the Werewolf–I don’t think it’s An American Werewolf in London, I think it’s just The Werewolf. I was terrified of wolves even though there were no wolves where I grew up. And werewolves, in particular. I think there are a lot of layers of psychology to that. I’m not sure I was making these connections when I was younger, but hearing my dad’s stories about getting sober, and his days of not being sober and the unpredictability of what that does to a person, brain and lifestyle. There was always this unsure quality to his memory and experiences that terrified me. I think I probably made a connection to werewolves. Lehrer: Usually when someone grows up around addiction, it can sometimes go one of two ways, a child will grow into addiction or will be a teetotaler. Are you one of those two extremes or in the middle? Herschlein: I think I’m in the middle. When I was younger, I was extreme about never doing drugs or drinking. That definitely changed. But I wasn’t interested in most drugs; I was interested in drugs like mushrooms, LSD and weed. Anything that would change my mind a little bit. Those were experiences that I could take back and learn something from. I wasn’t trying to turn off. Lehrer: Right. Terrence McKenna classified psychedelics and drugs as two different things. He defined the main difference being something to the effect of that while all chemicals can be habit forming to one extent or another, psychedelics (unlike drugs) can be literally habit breaking. Herschlein: That’s beautiful. Those have been important to me. I definitely have tendencies towards addictive behavior. I try to be careful. Lehrer: One thing I love about your work is that you work across mediums quite fluently. However, it doesn’t ever feel like your work is disconnected in any way. Your work all feels part of the same cohesive idea or aesthetic. Is this conscious, this rigorous exploration of this universe? Herschlein: I think so. I think part of what maybe happens a little bit for me is horror tropes. Like a horror novel about a horror writer. This sort of metafiction. There’s a lot of work I make about makers, and makers being made. Lehrer: Right, the New Museum store window was called The Architect. Herschlein: Exactly. Making bodies, making environments that I couldn’t be in, it creates storylines. I think that there are so many ways to do that, and one would be photographing it. I don’t all the time, but I usually have a camera around. If you are making objects in the world, it makes sense to take pictures of it. There’s this book of Brancusi with his photographs of his sculptures. I’ve never been moved by his sculptures, but his photographs sort of blew me away. Lehrer: The bodies you sculpt somehow are always disembodied, and a critic once said something about your work’s focus on trauma, or the traumatized body. But we never see what happens, we only see the aftermath. So there’s a narrative, but it’s an implied narrative. Is that accurate? Herschlein: That the actual physical body is traumatized is a bit misleading. More accurately, one of the ways we experience and think about our feelings is that we feel them in our bodies, and we can locate them in the physical body. I think I’ve always thought of it as like a feeling having a room in the body. It feels like architectural space in the body. One thing I’ve taken issue with is when people talk about the body parts I make being severed or dismembered because it’s not intended to be a violent act. It’s supposed to be a spotlight or a focus on this one thing, and this thing as an autonomous feeling or being. Lehrer: The way you just described it sounds less about violence than it does healing. Herschlein: Yeah, that’s completely what it is. But it’s about fear and discomfort, and the insanity of healing. The fear of trying to get through something. I’ve always had this feeling that I just wanted to blend into the environment. It’s not a suicidal feeling, but I wanted to sink into the couch or the wall. Just to be part of the background, not the foreground. Lehrer: And that’s a literal image that you use all the time in the work. Herschlein: Yeah, that might be the direct thing, the literal one-to-one (laughs). Lehrer: But there’s a universal alienation to the work, not just a solitary, personalized sadness. Herschlein: I think so. I’m definitely not just trying to express my own sadness or dissatisfaction. It’s about coping with feelings, instead of articulating exactly what they are. I think looking for comfort is a universal. Unfortunately, there’s a large number of people that [look at my work and] say, “That’s creepy,” and that’s as much as they say. But if they talk about why it’s uncomfortable, they end up talking about themselves. I’m trying to show you experiences that display things that make you feel a certain way that probably brings something up in you. Lehrer: I think in contemporary art especially, when you’re using images that move towards the abject or the grotesque, there’s definitely a line between something that’s effective, strong and provocative, and goofy or silly. And I always try to be hyper-conscious of this too, because I do have a part of me that loves to shock people. Herschlein: Discomfort is equally related to horror and comedy. When you’re really uncomfortable, you laugh. Lehrer: And contemporary art is hard to define, you just know it when you see it. 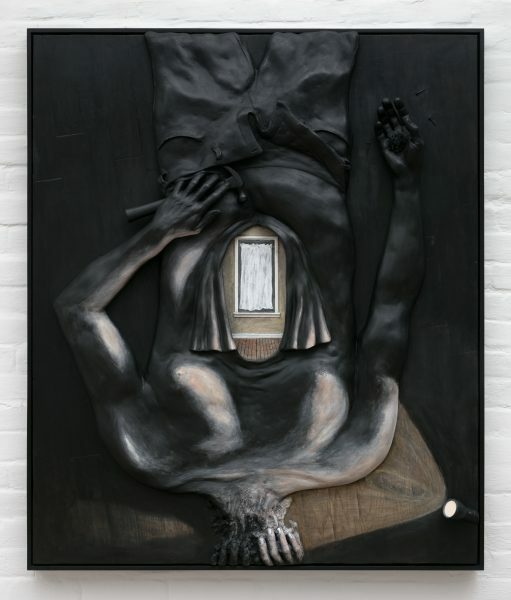 The boundaries between cartoonishness and provocativeness in terms of the grotesque in contemporary art are thin. Herschlein: Especially images coming from a sci-fi or horror genre background are hard to extrapolate into contemporary art, and sometimes they are not, you’re right, that line is slippery. Lehrer: How about we talk about the new work and the new show, why you went back to Long Island to make it, and how are these works different from other series? They are all based in a dark environment that has one single illuminated portion, almost like a performance documentation. Somebody actively trying to do something in this environment with a flashlight and then, somebody there trying to photograph it. I was conscious that these illuminated parts aren’t totally the most important part of the image. And when I say darkness, I mean painted darkness. People use light/dark to talk about things. I think you have to take them both into account equally. Things that you can’t see are just as important as things that you can. I think that being back on Long Island was accentuating that for me. Whenever I’m in a suburban place, I imagine what people do behind closed doors. Lehrer: The Twin Peaks of it all. Herschlein: Yeah, what is their real life when they aren’t getting an egg sandwich at the deli on their way to work? What are they hiding and why are they hiding? We all hide certain aspects of ourselves, that’s what a social structure does. Long Island is a place where there’s a lot of unhappiness for me. I was trying to get at how I felt as a kid and a teenager, and what were the things I focused on and what were the moments of reprieve? It was just trying to immerse myself in a space, and trying to work them into pictures. All these pieces are wall pieces. When people encounter a sculpture, there is an alienation there. There’s not an immediate context for a sculpture, but there is for a picture or painting. And if you can figure out the way to speak within that context, you can say a lot more. Adam Lehrer is an artist, photographer and writer. Lehrer’s work consists of manipulated photography, collages made of mostly Internet sourced appropriated images, and video loops. He has had solo shows at Spring Break Art Show, Governor’s Island Art Fair, and has been featured in group shows. Lehrer is also a culture writer, and his art, film and music criticism has been featured in Autre Magazine, The Quietus, Forbes, VICE, Bedford & Bowery, Bullett Media, i-D, SSENSE, and more. 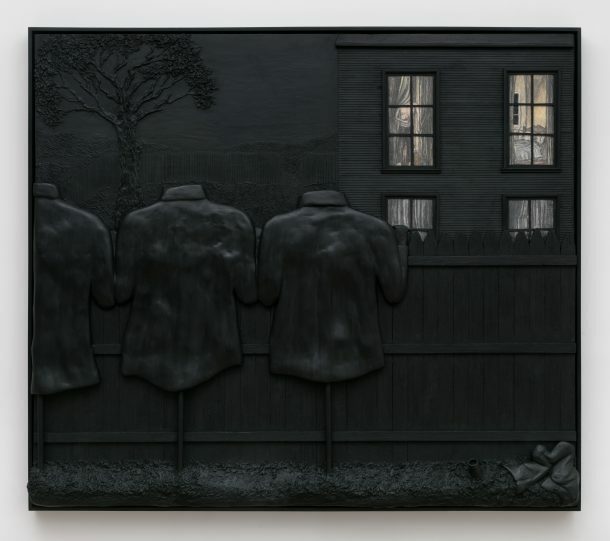 Tags: Dan Herschlein, JTT, JTT Gallery, Night Pictures. Bookmark the permalink.